More than anything, that's the reason forward Jack Skille is with the Chicago Blackhawks right now instead of the Rockford IceHogs. Blackhawks coach Denis Savard said so. So did Skille. "The difference with the kids that made our team and the kids that didn't is some of them started really well in camp and they tailed off, but the kids that are here started at this level and went up," Savard said. "They got better as camp went on. When you get to the end, that's what you see. With young players, consistency may not always be very good, but (Skille) was consistent." And he was just that in the defensive zone, the offensive zone and the neutral zone. Skille, who had two points and 18 penalty minutes in six preseason games, says he was just playing his game and that he was mentally tough enough to bring it every night. "This year I came in knowing there were a couple of spots open and I needed to put my foot in the door," Skille said. "I definitely did a good job of that." Skille got a taste of the NHL last season, playing 16 games from Dec. 30-Feb. 6. He scored 3 goals and had 2 assists. He basically took the ice time that belonged to Jonathan Toews, who missed 16 games from Jan. 3-Feb. 7 with a sprained knee. But Skille was gone by the time Toews came back. He felt like he belonged in the NHL, but isn't so sure he deserved to play there on a full-time basis just yet. "Obviously it was a numbers game last year and I didn't fit in that much," Skille said. "This year I came in knowing there were a couple of spots open and I needed to put my foot in the door. I definitely did a good job of that." Skille impressed Savard with his straight-line, energy play throughout the preseason, making him a perfect third-line guy. Patrick Kane, who like Skille is a graduate of the U.S. National Development Team Program, said he's been hearing that a lot about Skille. "He brings a lot of intensity because he's an up-and-down winger and he likes to crash and bang," Kane said. "It’s good to see him up here. It’s good to see him make the squad. I know he's wanted to do it for the last couple of years. For him to be here in that third-line situation is perfect for him." Savard, who this season is preaching a defense-first mentality, was thoroughly impressed with Skille's defensive awareness, another reason he made the team out of training camp. Savard even believes Skille can develop into a reliable penalty killer. "He has to take pucks to the net and be good on the walls, but you know he has been very sound defensively," Savard said. "I have a numbers thing that I do for games and I keep that for myself, but he was one of the best numbers during our training camp." "The one thing about skills is he has a real good work ethic and he’s got the speed," said defenseman Duncan Keith. "Because he is so young and is trying to establish himself he’s been real good defensively. You can tell he knows what he’s doing." Skille claims his confidence has never been so high and that he's playing with more of an edge. He feels as though he's climbed all the necessary steps to make it to the NHL, from draft day until now. He was the seventh pick in 2005, but knew all along that he was going to play at the University of Wisconsin for at least two years. He did that and produced 39 points in 67 games. 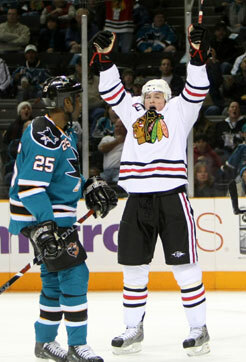 He also played in the 2006 and 2007 World Junior Championships, combining for 3 goals and 5 assists in 14 games. Skille left Wisconsin after his sophomore season to sign with the Norfolk Admirals, then the Blackhawks AHL affiliate. He had 8 points in 9 games to close the 2006-07 season. "I think it helped a lot," Skille said of playing for Norfolk. "Some college kids don't want to sign and go play in the AHL, but it was a good step for me to show that I cared and I wanted to go learn the pro game. It was a big step for me to get that out of the way so I was more prepared going into training camp." Last season he did the up-and-down thing, spending most of his time in Rockford (34 points in 59 games), but more than a month in Chicago. Now he's ready to play 82 games with the Blackhawks. Barring injury, he believes he'll do it. "Last year was all about development, about learning the pro game and getting out of that college style," Skille said. "Right now I'm an energy player. They want me to chip in on goals, but it's more being good on the forecheck and in the defensive zone and try to make things happen from there."